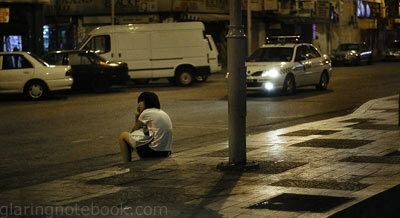 I eagerly awaited my ride in the center of town – Chow Kit. As I paced back and forth, trying not to look the inhabitants of the road in the eye, I counted the tiles. The tiles were rough, pitted, and had texture. They seem to keep a record of everything that came into contact. 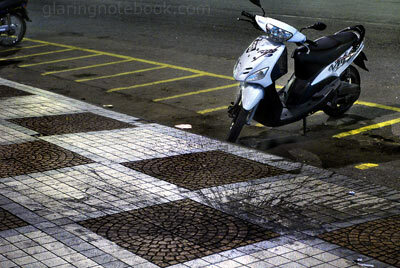 I could tell that the solid black patches were chewing gum, having served its purpose, spat down to the ground. The black splashes were drinks that had lost all of its reflectiveness and fluidity. 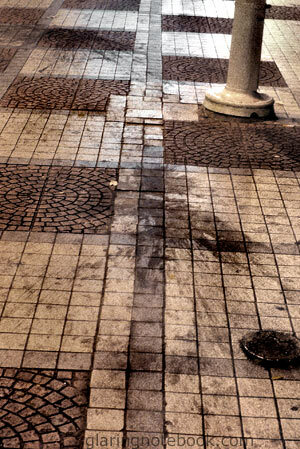 Its color seeped into the tiles, into the pavement, into the bed, the muscle tissue of Kuala Lumpur. Bandung, tebu, soya, orange, tea, oil, phlegm, urine, blood. It did not matter what, for every single stain on the tiling was black. I kept a steady pace and a wary look. A slight hunch at the neck, to look primordial, to look out, to look alert. I could not help but feel like a pirate, walking the dingy slums of a port. Others sat, their weary buttocks embracing the blackened tiles. For amusement, the sitters would squash cockroaches that came their way. It did not bother their shoes; the cockroaches don’t squirt juice. And yet, you could see a lack of enthusiasm, like it was formerly a great time-killer to look out for cockroaches to chase and step on. Some took to more arcane challenges. 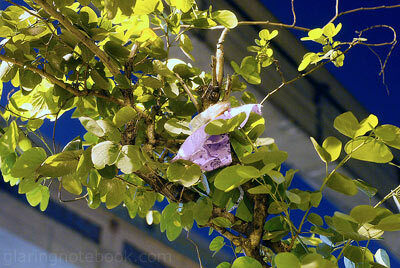 A Ramli burger wrapper was found in a tree, much much taller than the average inhabitant of Chow Kit. How it got there, was just as much a mystery to me as the black patches were. I could not tell its age, but it was still pink and bright as the day it was packaged. Perhaps, just perhaps, the kind soul who bought the burger and the wrapper with it, decided to spare it a certain discolored death on the tiles of Chow Kit. That indeed, was the work of a noble heart. This entry was posted in General, Pictures, Travelling on April 8, 2008 by 2konbla. udjinn: Later, later, in the queue. saifulrizan: No DRO at all, I turn it off at night – it will enhance noise greatly in ISO1600. The last shot is just &quot;normal&quot; exposure to the camera but looks slightly overexposed compared to what you should see at night. p/s: i keep chking in hoping to see sunburst pics.. you tease. Albert, this was taken with DRO what level? udjinn: Oh, I just spotted the typo. Just one letter off on the keyboard heh. lex: I don’t get what you mean… your phone isn’t black!